In 1587, White became governor of Sir Walter Raleigh's failed attempt at a permanent settlement on Roanoke Island, known to history as the " Lost Colony". 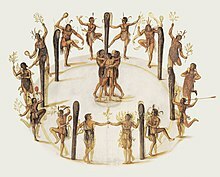 This was the earliest effort to establish a permanent English colony in the New World. White's granddaughter Virginia Dare was the first English child born in the Americas. In May 1587 White's colonists sailed for Virginia in the Lion. They were guided by the Portuguese navigator Simon Fernandez, the same pilot who had led the 1585 expedition and who was given by his fellow sailors the unhappy nickname of "the swine." The settlers' chosen destination was not Roanoke but the Chesapeake Bay. But, upon reaching Roanoke in late July,  and allowing the colonists to disembark, Fernandez refused to let White's men re-board ship. Due to weather which "grew to be fouler and fouler,"  White had to abandon the search of adjacent islands for the colonists. The ship's captain had already lost three anchors and could not afford the loss of another. White returned to Plymouth, England, on 24 October 1590.